The little metal guys normally stand at attention in rows — millions of them (molecules). When you heat them up red hot, they start dancing and get all mixed up and out of order; not in rows any more. When you cool them down, they get back into nice neat rows. However, when you cool them off really fast by dipping in cold water, they get frozen before they can get back into nice neat rows! If the metal guys are in nice neat rows, and you push on a row really hard, they can all move sideways. But if they are all mixed up, it’s hard for them to move any way. This makes the metal really hard. As part of Ezra’s box project, he needed to countersink the nails into the plywood. I should have one, but I don’t have a countersink handy that would do the trick. 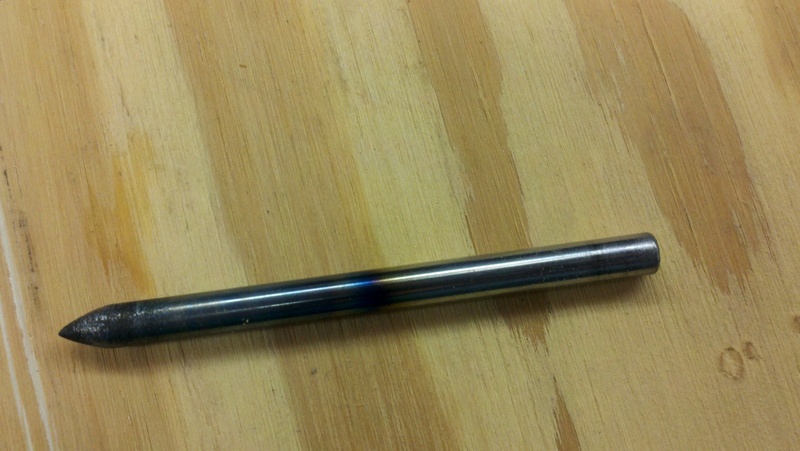 1/4″ diameter W1 tool steel rod (water hardened) was cut down to about 3.5 inches long. Being that I don’t have a metal lathe, I improvised by chucking the metal into my drill and grinding it on the grinder – while spinning. 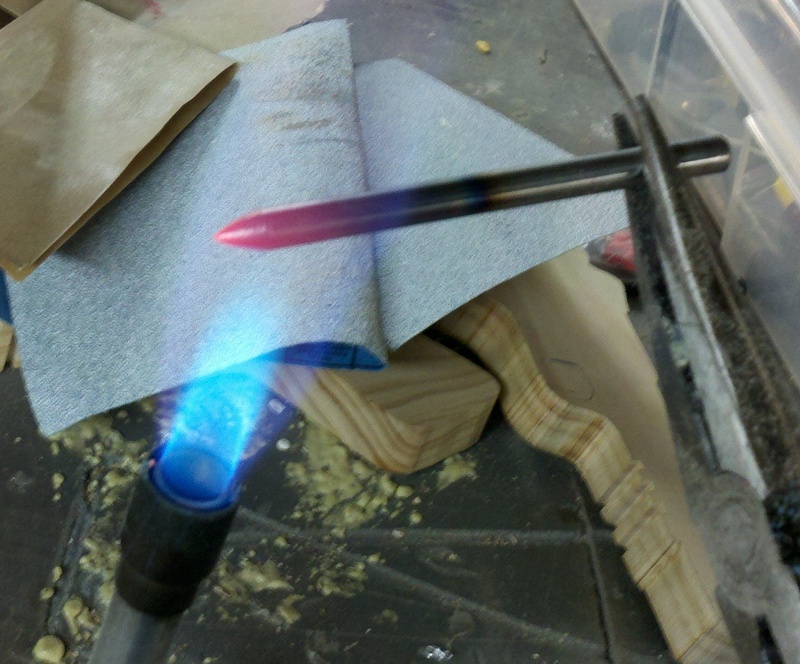 This resulted in a fairly uniform (albiet scratched) conical point. We wire brushed it a bit on the grinder to smooth it out, and then took it over to the other side of the shop for heat treatment. This casual approach to tempering worked well for our purposes. 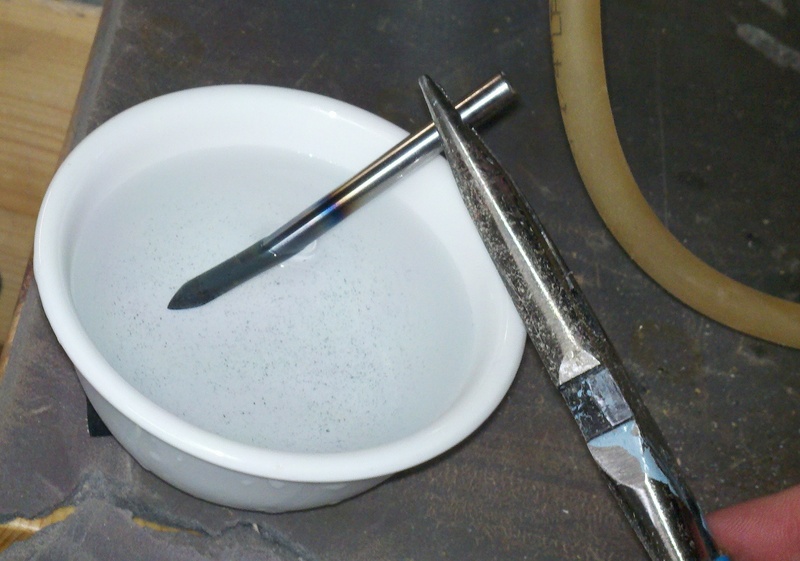 We heated the metal red hot (just the end) and dunked it in cold water. Then we polished it up a little bit. In informal tests, this made it REALLY hard. If I placed a nail against the top end and banged it, it would scratch the punch. If I placed a nail agains the bottom (hard) end and banged it, it would flatten the nail without even marking the surface of the punch. Also, the punch would reliably put small holes in a cast-iron vice and other metal without any noticeable deformation. Nice!